Answering this question is actually a fairly easy one to tackle. But there are two ways to go about it, and each way gives us a different picture of what the biblical writer is trying to do in Genesis. Now these are the generations of Terah. Terah fathered Abram, Nahor, and Haran; and Haran fathered Lot. Haran died in the presence of his father Terah in the land of his kindred, in Ur of the Chaldeans. And Abram and Nahor took wives. The name of Abram’s wife was Sarai, and the name of Nahor’s wife, Milcah, the daughter of Haran the father of Milcah and Iscah. Now Sarai was barren; she had no child. Terah took Abram his son and Lot the son of Haran, his grandson, and Sarai his daughter-in-law, his son Abram’s wife, and they went forth together from Ur of the Chaldeans to go into the land of Canaan, but when they came to Haran, they settled there. The days of Terah were 205 years, and Terah died in Haran (Genesis 11:26-32 ESV). 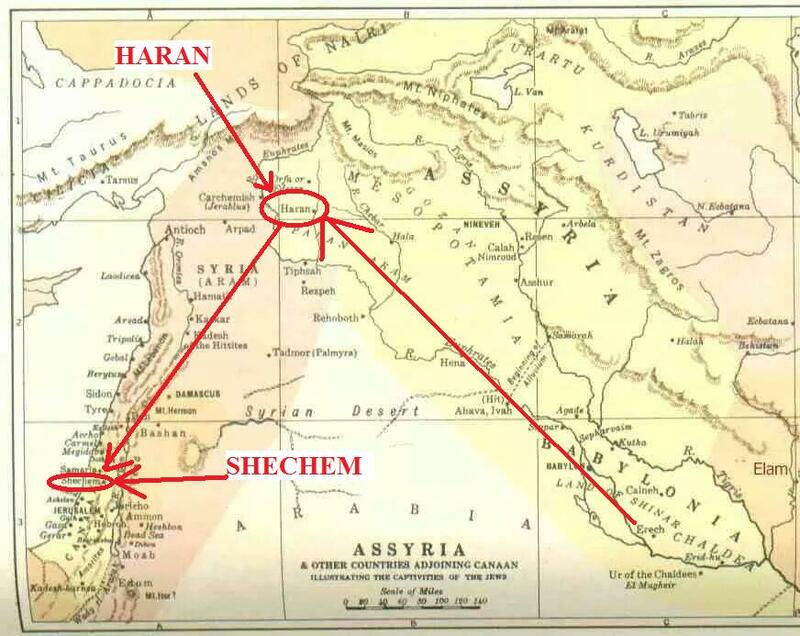 In summary, Abraham’s family moves from the land of Ur (in modern day Iraq), to Haran (in modern day Turkey), an area about half-way along the journey, across the Fertile Crescent, well short of reaching Canaan. As news unfolded last weekend of a man entering a Pittsburgh Jewish synagogue, and killing 11 worshippers, it was a sober reminder that anti-semitism is still a spiritual and moral disease to be reckoned with. My wife and I recently returned from a trip to Rome, Italy, and there we sadly learned that the story of anti-Jewish sentiment has much of its roots in the misuse of the Bible, throughout Christian history…. Our hotel in Rome was but a few blocks from the city’s famous Jewish Ghetto district, now a pricey part of town, lined with fantastic Jewish restaurants, to the culinary delight of tourists (such as this American! …. Try the artichoke! It is unbelievable!). But such upscale status was not always the case in Rome’s history. Compared to much of the rest of Europe, Jews in Italy have had relatively better treatment throughout history. Unlike stories of exile from England (1290) and Spain (1492), Jews in Italy have never experienced periods of mass exile. Rome’s Jewish community over the years had always lived fairly close together, keeping their Jewish identity intact over the centuries. Christians from a Jewish background, such as the apostle Peter and Paul, were most probably part of this ancient community, back in the first century. Though abused by pagan emperors, such as Cladius, as mentioned in the Book of Acts, Rome’s Jews lived mostly in peace, until the period of the Counter-Reformation, four centuries ago, right in the heart of the center of Western Christendom. 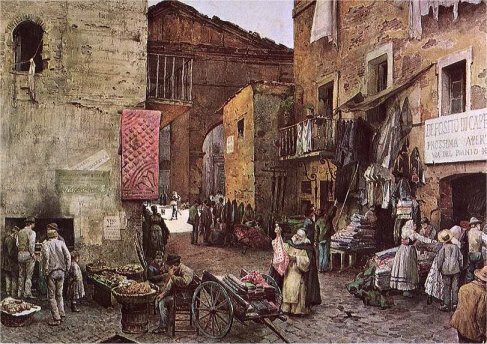 In 1555, the plight of Rome’s Jews drastically changed, when the Jews were forced to live together, in one of the most undesirable parts of the city, next to the Tiber River. 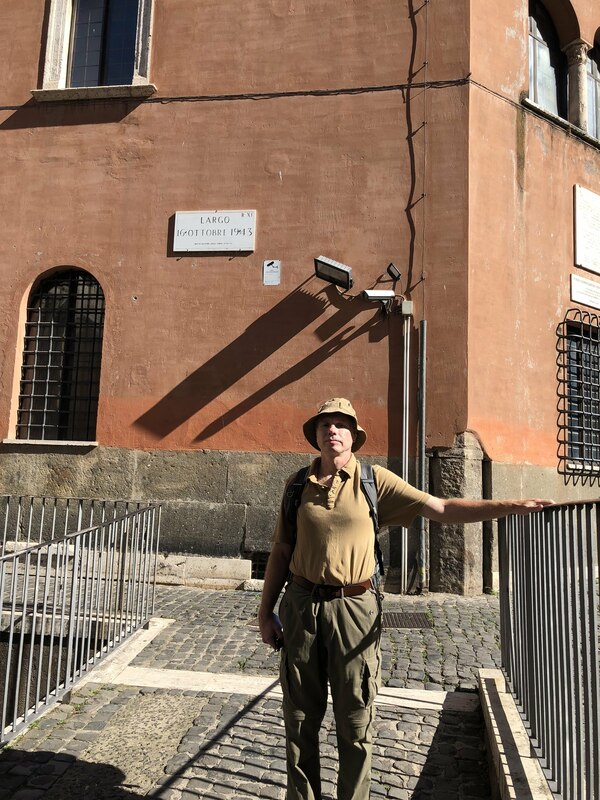 Established by a papal bull by Pope Paul IV, the Jews were huddled together in this walled-in ghetto, their homes susceptible to flooding from the nearby Tiber. Jews had their property rights taken away from them, and they were forced to listen to compulsory Christian sermons on the Jewish sabbath. Veracity blogger, in front of the Church of San Gregorio a Ponte Quattro Capi (Note the presence of the police officer behind me, just to my right, and his police vehicle to the left of the church door). Some of the successive Catholic popes relaxed various restrictions on Rome’s Jewish community, but the social upheavals of early 19th century Europe led to newer, and even tighter restrictions. 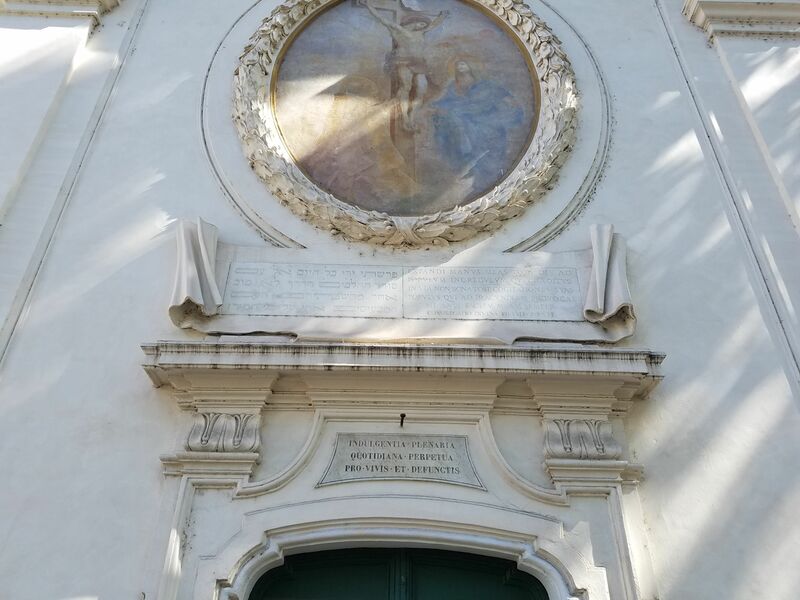 One such sign of this can be seen today, at the small Church of San Gregorio a Ponte Quattro Capi, at the edge of the ghetto district. Placed there in 1858, this is a good example of “right verse, wrong application.” The original context for this passage had to deal with God’s rebuke against Old Testament Jews, in Isaiah’s day, who had given themselves over to worship pagan deities. While it can be applied in our day, as God’s rebuke against all people (not just “the Jews”); that is, anyone who rebels against God, to suggest that this text is specifically targeting Rome’s Jews, with God’s displeasure, is a misuse of the text. No wonder so many Jewish people today harbor feelings of mistrust around some Christians! How would it make you feel to live in the Jewish ghetto? Compulsory housing code situated you and your family to live in a flood prone area, without any property rights of your own? Why on earth would anyone even want to listen to a sermon, using these Bible verses as a pretext, for legitimizing such coercion? 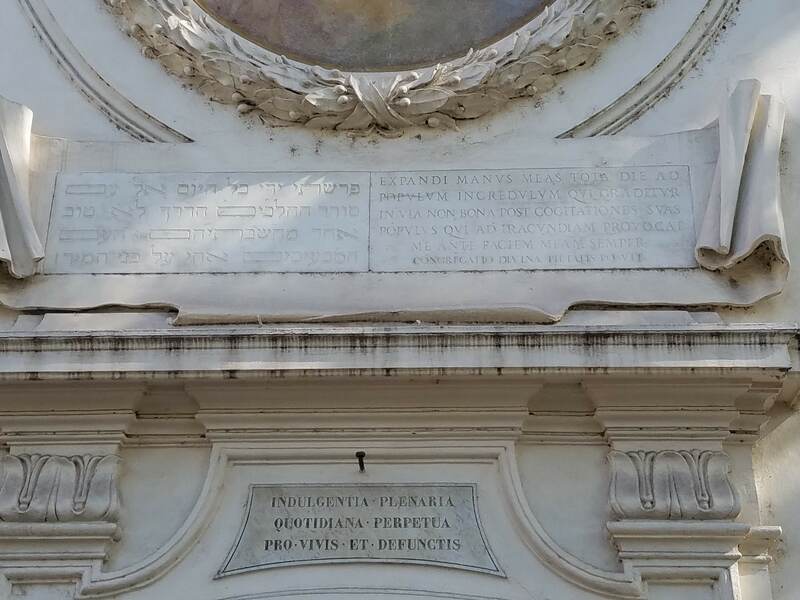 Inscription from Isaiah 65:2-3, in Hebrew on the left, and Latin on the right, from the Church of San Gregorio a Ponte Quattro Capi, overlooking the Jewish Ghetto (taken with my Android phone, October, 2018. Click on the image for a closer look). Conditions for Rome’s Jewish community improved when the Papal States were superseded by the relatively more-secular Kingdom of Italy, in 1870. The formal requirement forcing all of Rome’s Jews to live in the ghetto came to an end, and the unsafe living conditions of the ghetto, for those who remained, were vastly improved by raising the ground level and building a flood retaining wall to keep the banks of the Tiber in check. 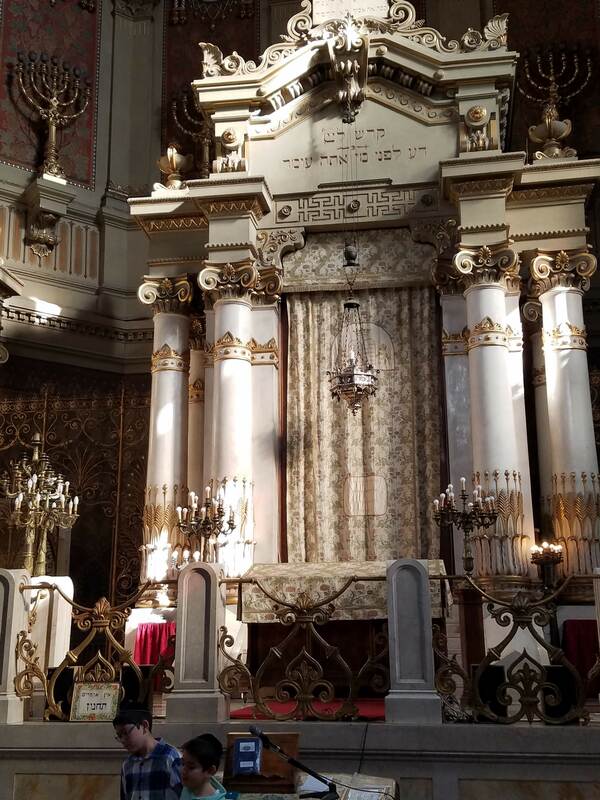 A new, grand synagogue was built, and completed in 1904, and the Jewish community entered a new age of relative prosperity. Rome’s Great Synagogue, finished in 1904. It may seem like I am piling on the Roman Catholic Church here, but Protestants do not get off so easy. When the Nazi’s rose to power in the 1930s, in Germany, some of their anti-semitic rhetoric came from the pages of Martin Luther’s On the Jews and Their Lies. When the Nazis eventually occupied Rome, during War World 2, Rome’s Jewish community fell under their uncharitable eye. The worst day for Jews in Rome, during the Nazi era, came on October 16, 1943. The Nazis drove trucks into the old Jewish Ghetto, rounded up as many Jews as they could, shipping many of them off to Auschwitz. The situation for Rome’s Jewish community has greatly improved since the days of the Nazis. In 1986, Pope John Paul II visited the Great Synagogue, followed by Pope Benedict in 2010, and recently in 2016, with Pope Francis. 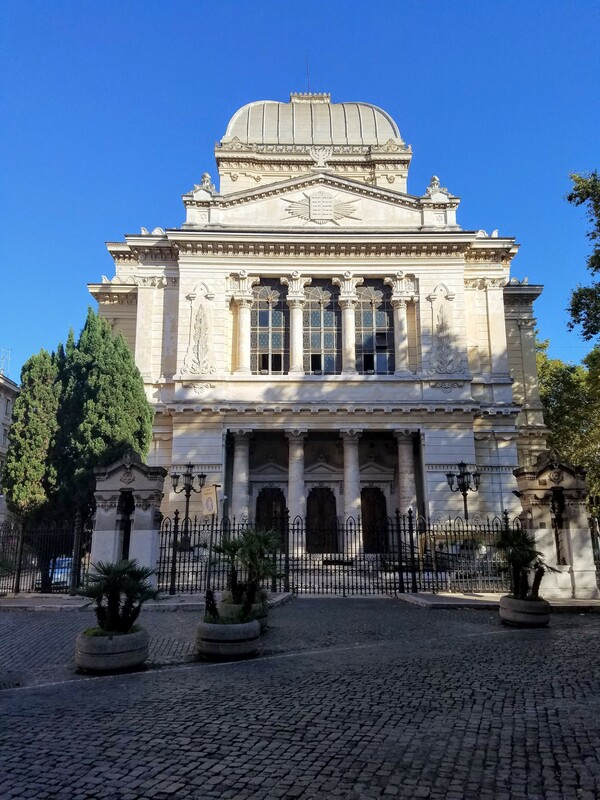 If you are ever in Rome, I would encourage you take a tour of the Great Synagogue of Rome. They have an incredibly informative museum, underneath the worship space, that interprets the history of the Jews in Rome, extending back to the pre-Christian, pagan era. However, if you do visit, you will notice that security is very tight getting into the synagogue and museum. Outside the synagogue, you will see Italian police officers, practically one on every corner. Rome has a high police presence, all across the city, but here in the Jewish ghetto area, it seems particularly high. 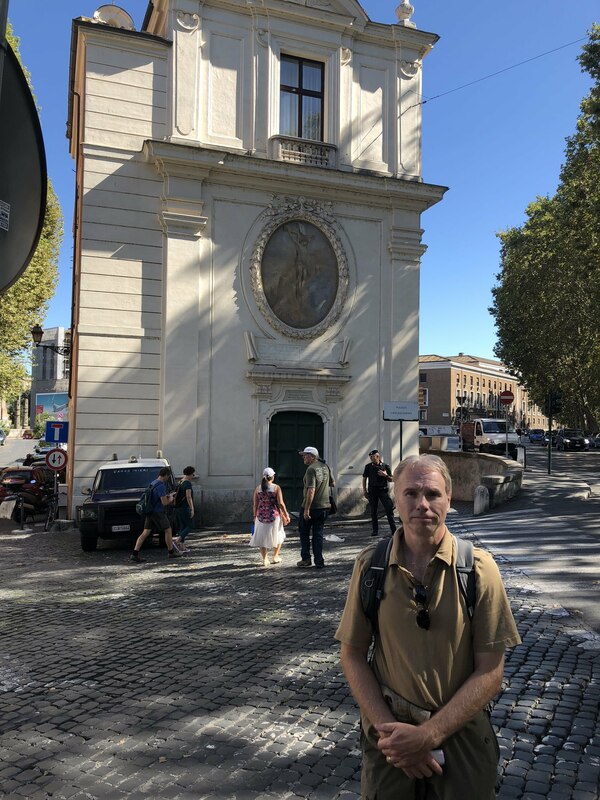 Just a few hundred feet down the street from the Great Synagogue of Rome, marks the spot (with a plaque, behind me on the building wall), where Nazi trucks came in, October 16, 1943, and abducted Jews to be taken off to Auschwitz, for extermination. When I spoke to one of the museum guides about the high security issues, she told me why access to the synagogue is so strict. In 1982, armed Palestinian militants stormed the undefended synagogue, killing one child. Ever since then, they have made every effort to restrict access to the synagogue, for safety reasons. Inside the Great Synagogue of Rome. The security situation in Rome came to mind when I heard of the recent tragedy in Pittsburgh. Whatever the motives of the synagogue killer, what happened in Pittsburgh has been labeled the most horrific single tragedy experienced by the American Jewish community, in U.S. history. Yet as Baptist leader, Russell Moore put it, “If you hate Jews, you hate Jesus.” Or consider the commentary of theologian Gerald McDermott, who challenges us to reach to our Jewish friends. Where does this ugly legacy of anti-semitism come from? Well, sadly, part of the problem can unfortunately be traced back to misguided thinking among of those who wrongly misread their Bibles, as was evidently done by those who forced the Jews to live in ghettos, like that in Rome. Earlier this year, I finished blogging my way through the controversial topic of “Christian Zionism,” examining the history and practice of how Christians have read their Bibles about the promise of the land, to the Jews and their descendants, in the Middle East. No matter where someone lands on that particular issue, we should all be wary of tendencies among those who read their Bibles, to justify all sorts of ill-treatment against our Jewish friends. Instead, may we all, as followers of Jesus, take our example from our Lord, who after all, was Jewish, and learn to better know how to love our Jewish neighbors with the truth of the Gospel. Nothing like a good cheeseburger…. or is there? 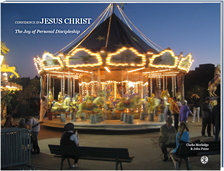 To end off this blog series on Christian Zionism, I want to offer the following parable. My wife is a gourmet cook. She is fantastic. Not only that, she loves to cook. I love to eat her cooking, so we have a mutual appreciation thing going on. One of my favorite foods is a juicy cheeseburger. I typically order one, if the restaurant has a good burger, much to my wife’s chagrin and concern over proper diet. But let us say that one day, my wife calls me up at work and says that she is promising to fix me a nice, juicy cheeseburger for dinner. Now, I have had a long, hard day, so the expectation of this future meal sounds very inviting. Furthermore, she has now promised to fix me such a burger. So far, so good. Is the secular nation state of Israel a fulfillment of Bible prophecy? A Veracity blogger tries to give an answer. Is he right, or is he misguided? In this blog post series on Christian Zionism, I have tried to cover a vast amount of material, highlighting the most significant, while still trying my best to hear all sides in the debate. At this point, I can only make a tentative conclusion. The Bible is a big book after all, and so as long as the Lord tarries, I hope to keep studying and keep learning the truths as expressed in His Word. I would hope to think that we as Christians can have robust conversations amongst ourselves on the topic of Zionism, in a spirit of “agreeing to disagree.” As long as we seek after the truth as found in God’s Word, we stand on good ground. My hope is that these blog posts have helped to move the conversation along. If you think I have something wrong, please let me know so that I can learn from you. So here is my attempt to make a conclusion, however tentative it may be. Martin Luther (1483-1546), by Cranach (credit: Wikipedia). Would Martin Luther eat his words and go to Jerusalem today, and get circumcised? In Martin Luther’s day, the Jews were dispersed all over Europe and parts of Asia. The sense of the Jews being different from everybody else eventually fed into the horrors of pogroms in later centuries. Luther’s frustration, that his Jewish neighbors seemed so resistant to his evangelistic efforts, finally sent the pious advocate of Reformation theology into an odd rage against the rabbis, in his old age. But what would Martin Luther think today, considering the events that have taken place in the Middle East over the last century? Would he scowl and double-down on his discontent with the Jews? Would he eat his own words, and make the journey to the Middle East, and take the surgical knife upon himself? Would he judge the legitimacy of such a nation state based on how well she treated her neighbors? Or would he be more cautious, and puzzle more… and even marvel… over why so many of these dispersed peoples have made it back to their ancestral land?